Well folks, we are live here in NYC for the event today where Amazon has just unveiled their new tablet, the Amazon Kindle Fire. Today they’ve fully unleashed this new 7″ tablet and are aiming for the likes of the iPad. Being smaller and more than half the price at just $199. We have all the info and pictures below so head on past the break for full details. Today in NYC Amazon announced not only a $79 Kindle e-reader, but the much anticipated Android running Kindle Fire Tablet. That is what we wanted to hear so lets break it down. 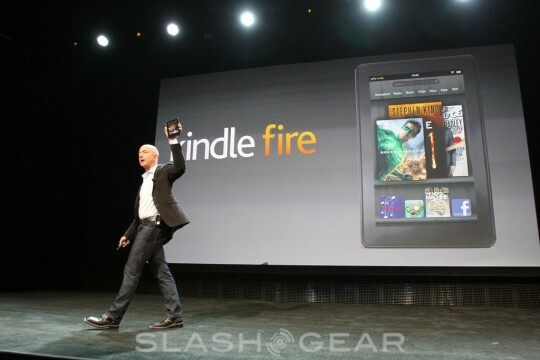 Just like recent leaks the Kindle Fire will be a 7″ IPS display Android tablet with gorilla glass, powered by a dual-core processor and weighing just 14.6 oz and features 8GB of internal storage. We have no hardware buttons in terms of navigation and everything will be on-screen controlled. The rest of the hardware specs remain a bit scant but most likely it will have 1GB of RAM along with that powerful dual-core processor. It is running on Android but it looks nothing like it. We see zero resemblance. The Amazon Kindle Fire looks very similar to the BlackBerry playbook and has no cameras, this is purely a consumption device people. Kindle Fire will have access to over 100,000 movies and TV shows, 17 million and more songs, access to the Amazon Android AppStore (growing everyday), Kindle Books and more. This story is developing and so are the details so stay right here as we continue to update. [Update] The Kindle Fire will officially be $199 and will ship starting November 15th. Pre-orders will be going fast even though they’ve probably got millions on the way. Pre-order the Kindle Fire right now at Amazon.com by clicking here.